Above: Tropical Cyclone Marcus as seen at 6Z (2 am EDT) March 21, 2018, off the northwest coast of Australia. At the time, Marcus was a Category 4 storm with 145 mph winds. Image credit: NASA. The first Category 5 storm of 2018 is Tropical Cyclone Marcus, which intensified to a low-end Cat 5 with 160 mph winds at 18Z (2 pm EDT) March 21, with a central pressure estimated at 921 mb. Marcus is located well offshore of the northwest coast of Australia, and is not expected to bring any direct impacts to land areas as it curves southwards, roughly parallel to the west coast of Australia. Marcus took advantage of very low wind shear and warm ocean temperatures near 30°C (86°F)--near average temperatures for this time of year. Satellite loops show a large storm with impressive organization, an eyewall with very cold cloud tops, and a 19-mile diameter eye. The storm is now headed into cooler waters, and has probably peaked in strength. If 2018 is an average year for Category 5 storms, we can expect four more Cat 5s this year. Earth averaged 5.1 Category 5 storms per year between 1990 - 2017, according to ratings made by NOAA's National Hurricane Center and the U.S. Navy's Joint Typhoon Warning Center. The record number of Cat 5s occurred in the El Niño year of 1997, which had twelve--ten of them in the Northwest Pacific, where most of Earth’s Cat 5s occur. In 2017, there were just three Cat 5s globally. This was the lowest total since 2012, and well below the unusually active years of 2014 - 2016, when eight or nine Category 5s appeared each year. On Sunday, Marcus hit the northern Australia city of Darwin as a tropical storm (see radar loop here), knocking out the power to over 20,000 customers. 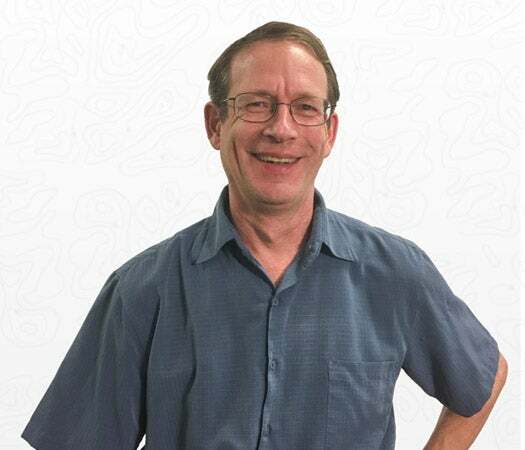 Marcus brought a wind gust of 81 mph (130 kph) to Darwin, which was the highest gust from a tropical cyclone measured there since Tropical Cyclone Tracy devastated the city on Christmas Day in 1974. Since accurate satellite records began in 1990, the Joint Typhoon Warning Center has catalogued 18 Category 5 storms in the South Indian Ocean—an average of approximately one Cat 5 every two years. 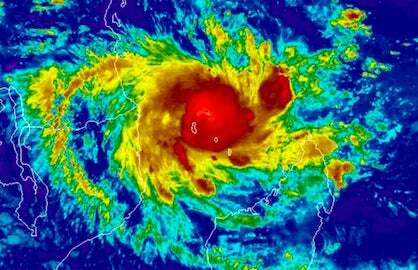 Marcus is the first Category 5 tropical cyclone in the South Indian Ocean since Tropical Cyclone Ernie, which intensified to a Category 5 storm with 160 mph winds northwest of Australia in April 2017. Tropical Cyclone Fantala of 2016 (180 mph winds) is the strongest cyclone ever observed in the South Indian Ocean. 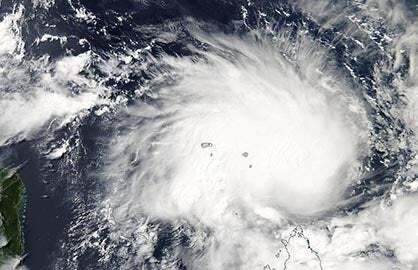 Fantala is also the all-time intensity record holder for the entire Indian Ocean, since it tops the record holder for the North Indian Ocean, Super Cyclonic Storm Gonu of June 2007 (peak 1-minute winds of 165 mph). Note, though, that some consider Tropical Cyclone Monica of 2006 (180 mph winds) tied as the strongest Indian Ocean Basin storm on record. Definitions vary on the boundary of the Indian Ocean, though, and Monica reached peak strength north of Australia in the Arafura Sea, which is considered by several sources, including the CIA World Factbook, to be part of the western Pacific Ocean, not the Indian Ocean. Figure 1. Visible image of Tropical Cyclone Fantala collected at 1025Z (6:25 am EDT) on April 18, 2016, by the Moderate Resolution Imaging Spectroradiometer (MODIS) sensor on board the Aqua satellite. The north tip of Madagascar can be seen at bottom. 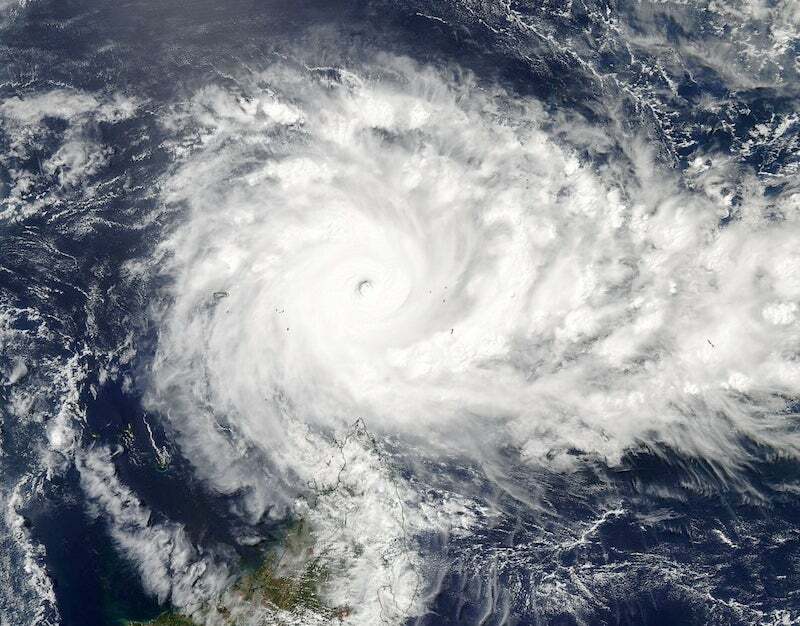 At the time, Fantala was the strongest tropical cyclone ever observed in the Indian Ocean, with winds estimated at 175 mph. Fantala did $4.5 million in damage to Agaléga, Seychelles, Madagascar and Tanzania, and killed thirteen people in Tanzania. Fantala’s intensity was aided by ocean temperatures that were more than 1°C (1.8°F) warmer than average. Image credit: NASA. The Southern Hemisphere tropical cyclone season, which peaks in March, is fairly close to average in most categories this year, thanks in part to Marcus’s ascension to Category 5 stature. Real-time statistics on accumulated cyclone energy (ACE) maintained by Phil Klotzbach (Colorado State University) show that the South Indian Ocean basin west of 135°E longitude, which includes cyclones affecting Western Australia, was running close to average for seasonal ACE, though the number of named storms so far this year (11) was below the usual number for this time of year (14). The South Pacific east of 135°E has been quieter than average, with just 4 named storms (compared to an average of 8 for this time of year), and an ACE about 75% of average. 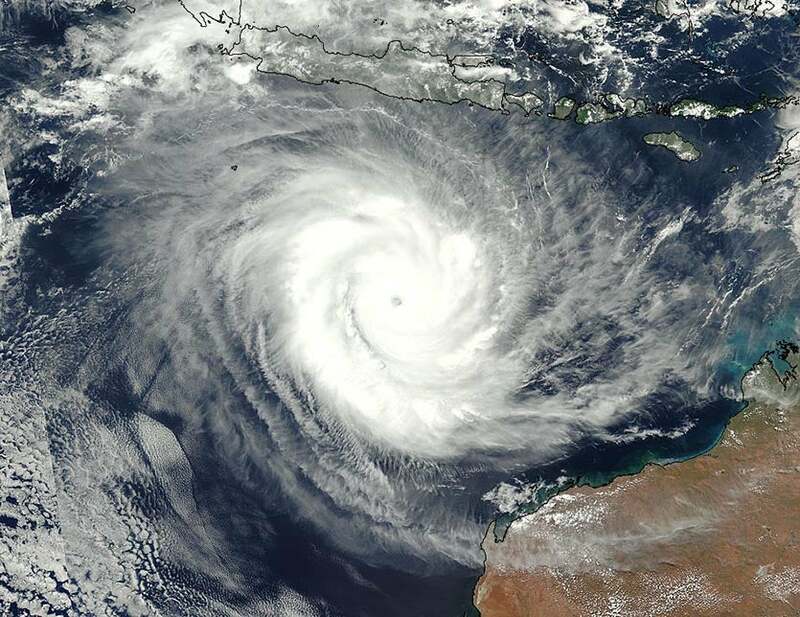 La Niña conditions, which have been in place during the current Southern Hemisphere tropical cyclone season, tend to produce warmer SSTs and reduced wind shear in the waters along the west side of Australia, both of which favor tropical cyclone activity. About twice as many cyclones make landfall in Australia during La Niña than during El Niño, according to the nation’s Bureau of Meteorology. Significant flooding in Australia is also more likely when La Niña holds sway. There have been two deadly South Indian Ocean tropical cyclones thus far in 2018. Last week, Tropical Storm Eliakim brought 65 mph winds and torrential rains to Madagascar on March 16 – 17, killing 21. 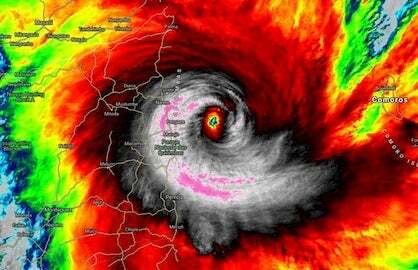 The deadliest tropical cyclone thus far in 2018 was Tropical Cyclone Ava, which hit Madagascar on January 5 as a Category 2 storm with 110 mph winds, leaving 73 people dead or missing.